This is an open topic for 1.4.0 feature requests, I'm not using a poll this time, instead you can make suggestions for whatever you want to see in the next version of the RPGWizard. I'm aiming for a early/mid summer release for 1.4.0, so they'll a good bit of time for new stuff. Please be as specific as possible with the feature you want and why you want it, preferably with images of other solutions. Refrain from suggesting anything silly such as a warp drive, RPGWizard won't be taking anyone to the moon (yet). An undo button for the boards. Have the editor remember the previously open project for the next startup. Better board vector tools, shapes, and dedicated board program tool. while I haven't tested the default battle engine, is there a front view option? if not, maybe two options to add to battle engines would be Front/Side view, and (if front view) Sprite or Profile image. 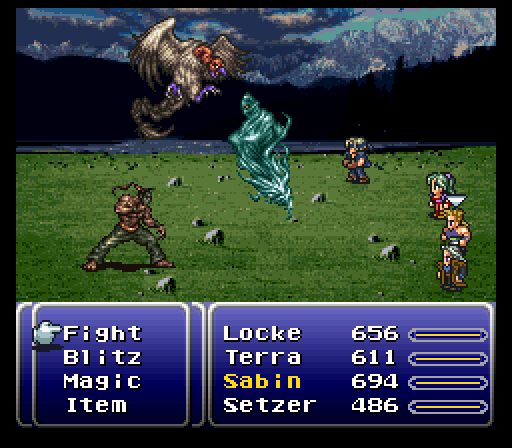 Sprites would stand atop the standard battle info window. Profile would just have a square image representing a character in the battle window. Additionally, in Side view, maybe have a option of stationary or mobile enemies, with mobile enemies making slight movements forward when they have a turn. "People fear the unknown, but they also fear obtaining the knowledge to understand it, for understanding the unknown means learning forsaken truths"
Well technically at the moment there isn't a default battle engine, there are 2 examples. One of them is the Wizard's Tower (board turn-based) and the other a Zelda battle system. Maybe I'll get sometime to work on it in the future. A 'include default battle/menu system' option could be added to project creation. A 'load programs before running' kind of feature (in the project window) could be added. It'd basically just call loadasset before the start up program/board is ran. The default systems and their programs could be added to that list on selection. After they've been made of course. I'll try and convert the action battle system into an easier to edit format - for a skill/item throwing system (don't count on it). Moving it to a module pattern might make it a bit easier. The battlesystem DFroG mentioned seem rather interesting. I think it's basically the one you've posted but with an orientation option. I think all that would be needed for that is a few if statements in the draw functions. - A sprites collision box. I mainly want to use it as a reference point to spawn things. Note: I think sprite location is just the top right corner of the sprite and not the center point of the collision rect. I forget. Last edited by rpggamer17 on Wed Jan 31, 2018 5:26 pm, edited 2 times in total. Is that from Dragon Quest, swordmaster? @DFroGGotten1, yup that is from Dragon Quest. Can't remember which one now mind you, haven't even played them just like the style of that battle system. A pretty simple battle system could be made based on boards, the player, NPCs/Enemies. Basically when you start a battle you'd actually be sending the player to another board, which would save on writing custom rendering code. You could then take advantage of the layer images for background and foreground. You could even use a layer for the UI graphics, you'd just have to use RPGCode to draw the text and cursor then. You could set the board entry program to be the battle system, and based on some variables you set before starting the battle, it would place NPCs and Enemies on the board, plus the player's character of course. Then you could just let that program run until the battle ends, and send the player back to the previous board or whatever. Feel free to make improvements to the ARPG battle system and reply on the topic, I'll check them out, and update it etc. Project templates does sound like a good idea. It'll be nice to have options like 'adventure', 'rpg', 'Jump platformer', 'space shooter', etc. So, let me think what else i will wanna see? -An undo button for the boards. -An open project on startup option. -A easier way to add programs to the board. I think that would be the vector tools feature from the last post. -When you type 'rpgcode.' can a list of the functions show up? -A popup list of variables and functions for the default objects. The rpgcode.getSprite(spriteid) and rpgcode.getCharacter() functions, not much is really known about their inner-workings (unless you browse the source or use JSON.stringfy()).